Imagine a mood tracker, mindfulness coach, anxiety helper and mood-boosting buddy, all rolled into one. 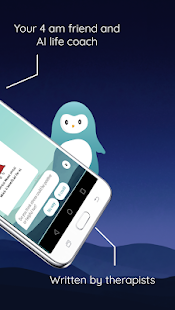 Wysa, your happiness buddy is that friendly and caring chatbot. 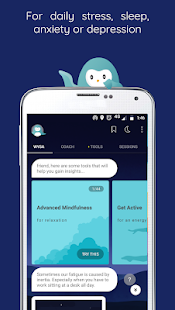 Always there for you when you need someone to talk to, Wysa helps you keep track of your mood with friendly chats and helps fight stress and anxiety with its proven techniques and calming meditation and mindfulness audios. Checking in with Wysa regularly will help you build resilience and improve your emotional health so you can track your happiness and mood. 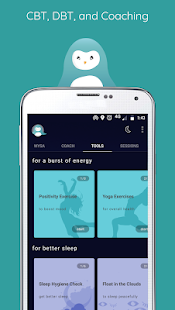 Talk to Wysa now and psy yourself up to fight off stress. 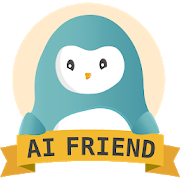 Wysa is your AI friend that you can chat with for free. 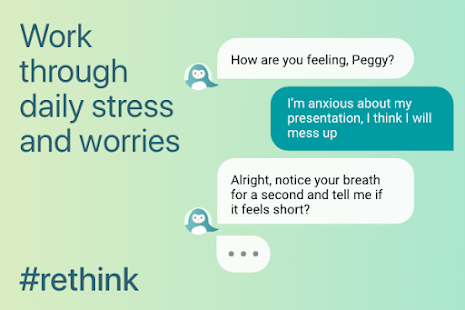 You can talk to the cute penguin or use its free mindfulness exercises for effective anxiety relief, depression and stress management. 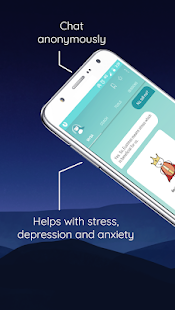 Its therapy based techniques and conversations make for a very cute and calming therapy chat app whether you're looking to cope better with mental disorders or to just manage stress. 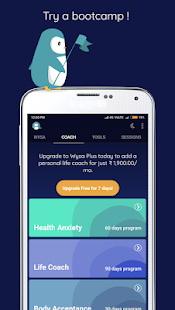 Check in with Wysa regularly to boost your mental health. Wysa, your happiness buddy, will support you through the big and small anxieties of life by using science as a foundation to strengthen your mental health. 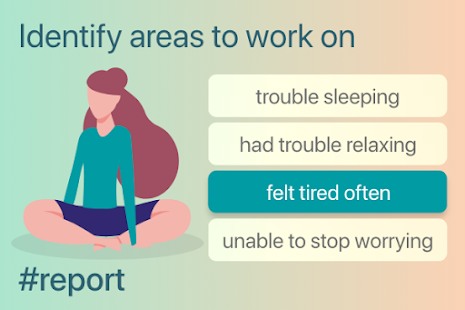 Research-backed, widely used techniques of CBT, DBT, Yoga and meditation are employed to support you with stress, anxiety, sleep, loss and a whole range of other mental health and wellness needs. 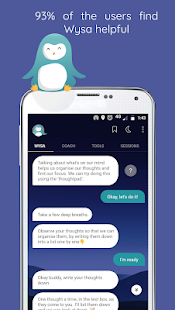 If you are dealing with stress, anxiety and depression or coping with low self-esteem, then talking to Wysa can help you relax and get unstuck - it’s empathetic, helpful, and will never judge. You will overcome your mental health obstacles, through a combination of empathetic conversation and free CBT therapy based technique. So, pour your heart out to your happiness buddy, Wysa as your identity will remain anonymous and your conversations are privacy protected. 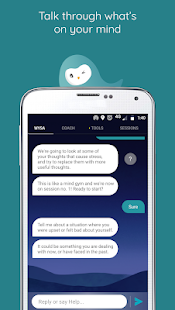 Used around the clock and trusted by 500,000 people, Wysa is an emotionally intelligent chatbot that uses AI to react to the emotions you express. 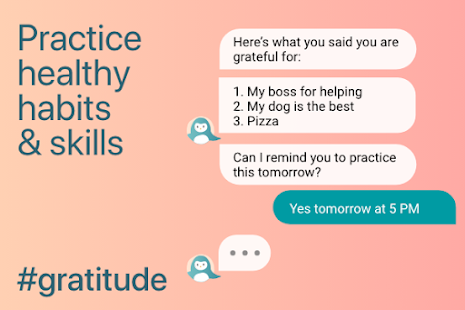 Unlock tools and techniques that help you cope with challenges in a fun, conversational way. For extra support, you can avail of guidance from a real human coach - a qualified skilled mental health professional who will take you through the advanced coaching sessions for your personal needs. You can use Wysa to rewire your mind to improve your emotional health. Fight off depression or get stress relief using cbt techniques and guided meditations which helps you relax. 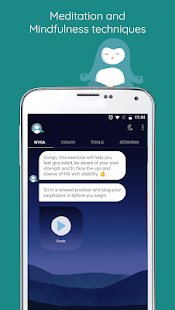 Here’s a look at what you can use Wysa for Vent and talk through things or just reflect on your day Practice CBT (Cognitive Behavioral Therapy) and DBT techniques to build resilience in a fun way Use one of 40 conversational coaching tools which helps in dealing with Stress, Anxiety, Depression, Panic Attacks, Worry, Loss, or Conflict Relax, focus and sleep peacefully with the help of 20 mindfulness meditation exercises 93% of the people who talk to Wysa find it and the tools helpful: - Build confidence, reduce self-doubt and improve your self-esteem: core meditation and mindfulness, visualisation, confidence visualisation techniques, advanced mindfulness for self-esteem. - Manage anger: mindfulness meditation exercises for compassion, calming your thoughts and practice breathing - Manage anxious thoughts and anxiety: deep breathing, techniques for observing thoughts, visualization, and tension relief. - Tired? Get a burst of energy! Visualisation and meditation exercises to increase positivity, quick yoga and physical exercises to get active - Dealing with worry: observe mindfulness, resolving technique, challenge negativity, practice breathing techniques - Manage conflict at work, school or in relationships: special mindfulness and visualization techniques like empty chair exercise, gratitude meditation, exercises to build skills in having difficult conversations Give it a go!